Residents in a road where a spike-topped wall once divided rich and poor have slammed a decision to lay new Tarmac only at the "posh" end of the street. 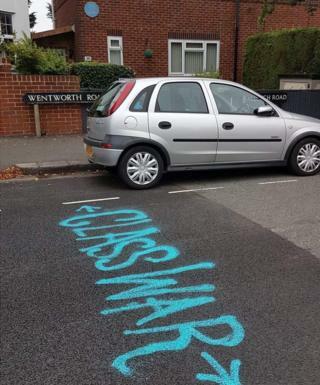 The fresh surface, in Wentworth Road, Oxford, was spray-painted with the words "class war" after it appeared. Those in neighbouring Aldrich Road said the work stopped at the point where the Cutteslowe Walls stood. Oxford City Council said the decision was based on need. Rachel, who did not want to give her surname, has lived in Aldrich Road for 30 years. She said: "The council should have resurfaced the whole road. They've gone right to where the wall was so I can understand why people are angry about it. "By doing this they've caused a massive issue. I'm angry about it but spraying graffiti over the road is not on." Finally, on 9 March 1959, after the city had purchased the strips of land on which the walls stood, they came down. Another resident, Liz Patterson, said: "It's possible our road didn't need doing, but given the history you can understand why people might feel like that. "This is a small community, there are pockets of poverty. "The resurfacing stops right on the divide so of course people are going to question that. It's absurd. "When I saw it I thought: 'I'm obviously on the wrong side of the road'. "While I can see some humour in it, others are upset." Oxford City Council said: "Oxford Direct Services resurfaced Wentworth Road earlier this year. "The decision to resurface this road was purely based on need. "The structural condition was far worse in Wentworth Road and this led to the decision to resurface this road first."